Tasting Vietnamese fish sauce (nước mắm) is a must if you want to learn about my country’s cuisine. Can you believe that famous sauce is “rotten fish”? Yes, it is, literally. But don’t panic, it’s not fishy at all. On a contrary, it’s a very tasty, strongly flavored liquid. No wonder fish sauce becomes the most popular condiment that Vietnamese families use in daily meals. In terms of health benefit, initially I just simply feel that it’s delicious. Like all other Vietnamese, I used up the sauce since I was born. Though it was most-used fish-extract liquid in my family, I didn’t realize how nutritious it is. Recently, upon doing some research to write this article, I have surprisingly found out that the simple ordinary fish sauce contains healthy nutrition including protein and B vitamins. Well, that’s an interesting discovery for me. 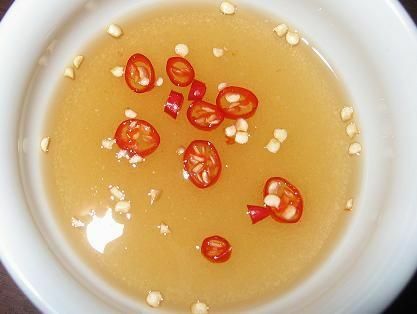 Through reading this article, you will likely find out another Asian quintessential dipping sauce for your daily menu. I’ll summarize here how Vietnamese fish sauce is made. I saw my uncle did that in his kitchen at a small scale for his family consumption. In my place Haiphong with Cat Hai as a famous fish sauce brand, many people know how to make fish sauce. Fish collected from market will be cleaned by water. The best material is anchovy fish (cá cơm). Fishes should be fresh. Stale material will ruin the natural flavor of the sauce product. Fishes are mixed with sea salt at a certain ratio, ex. 7:3, meaning 7 kilograms of fish goes with 3 kilograms of salt. The mixture (called chượp) is placed into containers like wooden barrels or concrete tanks. The top layer was pressed by bamboo-net and heavy stones. After a fermentation period of about 12 months, the fishes are totally hydrolyzed. The first liquid dripped out from the mixture has very rich protein content. Part of it is used to produce a special grade called nước mắm nhĩ. This type has light amber color, transparent, the most delicious and valuable fish sauce. The remaining takes some more time to finish. Four most famous brands of fish sauce in Vietnam: Cat Hai, Nha Trang, Phan Thiet, Phu Quoc. These are not specific makers. Instead, each represents a whole region. For example, Cat Hai is an island in Haiphong, and many families and business units produce the Cat Hai fish sauce. 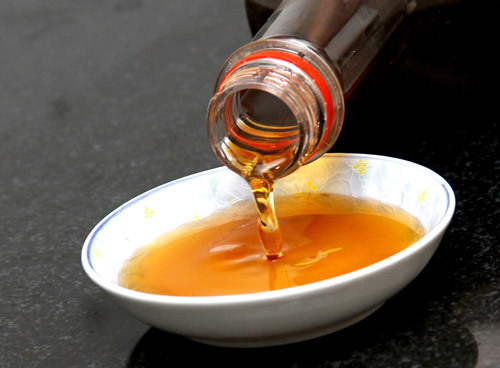 Recently, Chin Su fish sauce appeared in Vietnam domestic market and achieved great success in term of popularity. It tastes sweet, but not so natural like the traditional fish sauce. Perhaps, that’s thanks to marketing stuff. Personally, I still prefer Cat Hai. Though Vietnamese use fish sauce in daily meals, we don’t usually eat bare sauce. Instead, we use in several creative ways. First, we add fish sauce to into cooking foods to make a natural and flavor salty level. Secondly, we dilute fish sauce by mixing with other ingredients to make a bundle of dipping sauces. That means we use particular dipping fish sauce for each food like: spring roll (chả nem), shrimp in batter (bánh tôm), pancako (bánh xèo), boiled water spinach (rau muống luộc), and grilled meat (thịt nướng), among others. More about Vietnamese dipping fish sauce here. Good nuoc mam should be transparent, and you should be able to see the other side of the bottle. It has a clear, reddish brown color, like the color of good whisky, without any sediment. Good sauce tastes a little salty at first, but the aftertaste is sweet. In Vietnam high grade fish sauce is usually contained in glass bottle and used to make dipping sauces. Plastic containers hold lower quality type, which is used as cooking sauce only. It’s certainly so easy to buy fish sauce in Vietnam. 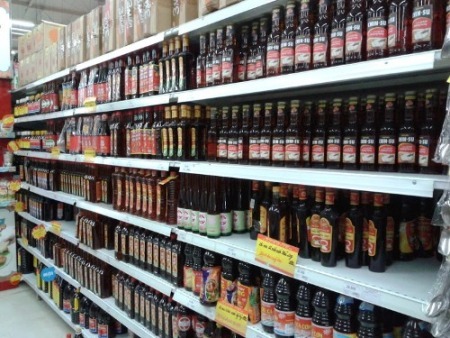 Going in a grocery store or a supermarket, you’ll see an entire aisle for fish sauce of all types and brands, along with other dipping sauces like soy sauce, shrimp paste, vinegar, etc. For people not living in Vietnam, you can go to Vietnamese or Asian groceries to choose and pick up a bottle. As I find out from several online stores, it cost about US$3 to $5 per bottle. You may also buy in online sources, such as Amazon.com. It will cost a little more though. It’s pretty simple to store this kind of sauce. You can just tightly close the bottle to avoid smelling, and put it in a cool place. Storing in a refrigerator is better, but not really necessary. If you leave it unused for too long time, it may turn dark or crystallize, then just discard it. As you may see, fish sauce is likely a crucial part of Vietnamese cuisines that all Vietnamese are proud of. By writing this article, I hope to deliver part of that spirit to you. If you also love Vietnamese fish sauce and like what I’m writing here, just click Like to encourage me. If you don’t, I appreciate that you can tell me why. I’d love to hear from you.